Wed., March 2, 2016, 10:16 p.m.
Tyler Dorsey scored 20 points and No. 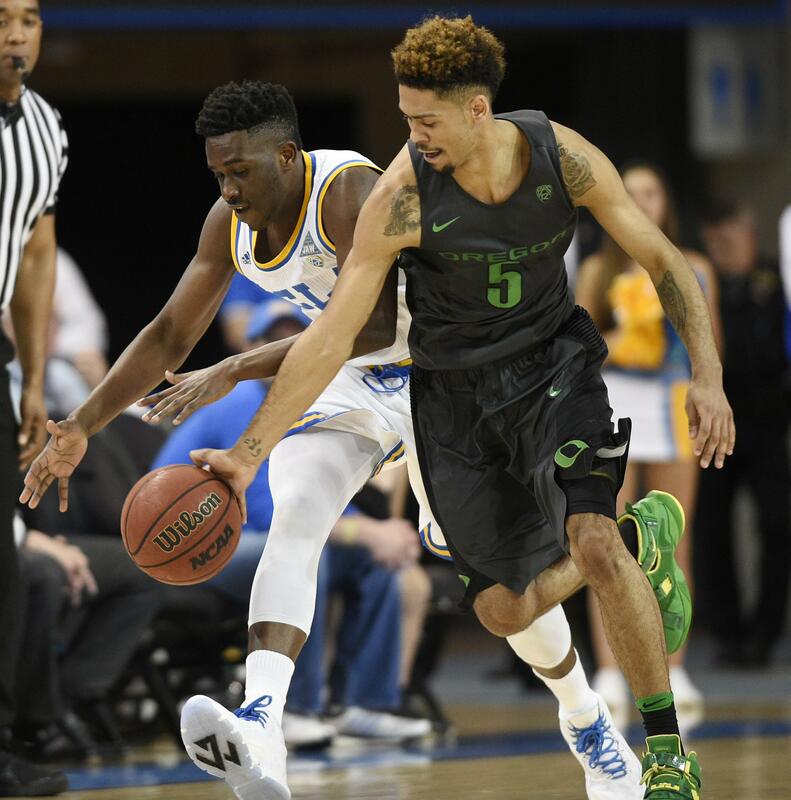 9 Oregon rallied in the second half to beat UCLA 76-68 on Wednesday night in Los Angeles, giving the Ducks at least a share of the Pac-12 title for the first time since 2002. Dillon Brooks added 15 points, and Elgin Cook had 14 points, making all six of his free throws for the Ducks, who won their fourth in a row and 10th in 12 games. Dorsey had a team-high nine rebounds, helping the Ducks control the boards 40-28. Isaac Hamilton scored 19 points, Tony Parker added 18, and Bryce Alford 16 points for the Bruins. They have lost three straight and six of eight with one game remaining in the regular season. Alford’s 3-pointer put UCLA back in front 23-21 and launched an 18-12 run that ended the half with the Bruins leading 38-33. Alford and Hamilton each had six points in the spurt, with three other players scoring, too. The Ducks clinched the No. 1 seed for the Pac-12 tourney in Las Vegas. USC 81, Oregon State 70: Jordan McLaughlin had 17 points and nine assists as the Trojans rode a hot-shooting first half to a victory over the Beavers in Los Angeles. Katin Reinhardt scored 15 points and Bennie Boatwright added 13 for the Trojans, who snapped a three-game losing streak and moved into sixth place in the conference standings with one regular-season game remaining. Nikola Jovanovic had 10 points and eight rebounds for USC, which won for only the second time in seven games and improved to 16-1 at home. Southern California reached the 20-win mark for the first since 2008-09. Gary Payton II had 19 points, seven rebounds and five assists to lead Oregon State, which dropped to eighth place in conference with one league game left. Stephen Thompson Jr. added 17 for the Beavers, who fell to 1-7 in conference road games. The Trojans ran off a season-high 56 points in the first half, making 21 of 34 (62 percent) from the field, including 8 of 11 from 3-point range. USC finished off the period with an 18-4 spurt for a 56-33 halftime lead. Published: March 2, 2016, 10:16 p.m.